Sherlock and Watson investigate a series of murders connected to a plane crash. Beneficiaries are being shot with envelopes of cash left behind. Watch Elementary Season 3 Episode 15 online to find out the motive behind the crimes. A woman sells jewelry for cash. After giving a homeless man a bag of food, she shoots him and leaves an envelope of cash. Sherlock connects the message left with the cash to Arlen Schrader, a prominent victim's compensation attorney. Schrader is famous for his formula that determines the amount a person is worth. Another victim is found with an envelope of money and the note is directed to Aceway Airlines CEO. Sherlock realizes all the victims are beneficiaries of the victims of Aceway Flight 1059. They are considering two formulas for the victim payouts, Schraders and a fixed payment. The killer, Dana, receives a foreclosure notice on her home and fakes an attack on herself. Afterwards she goes to the press and rails against Aceway paying a fixed amount since her husband was rich and would receive more under Schrader's formula. Aceway selects the fixed-payment. Sherlock suspects she is the behind the murders. Meanwhile Joan moves back into the brownstone but gets upset when she finds out that Sherlock rented her old apartment. Why would Dana want a fixed payment when she would lose money with that method? Why did Sherlock rent Joan's apartment? Find out the answers when you watch Elementary Season 3 Episode 15 online via TV Fanatic. 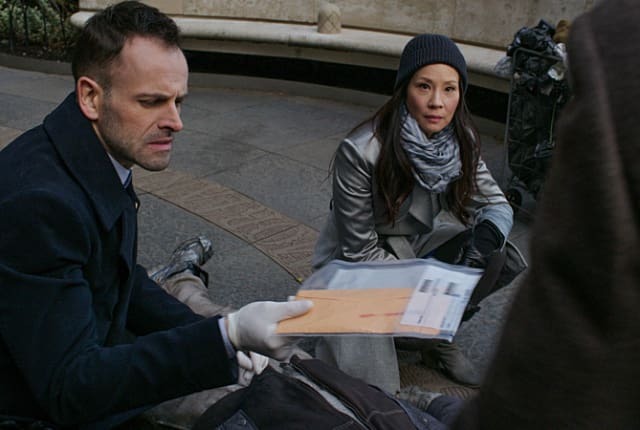 On Elementary Season 3 Episode 15, Holmes and Watson investigate a series of deaths where the killer left envelopes of cash on the bodies. Watson: Do you want me to live here or not? Sherlock: I do. I have never wavered on that. Permalink: Do you want me to live here or not? I worried in the aftermath of trauma that you might be ... overadjusting. That moving back might not be the progression you believe it to be, but it might be a regression, a retreat into the safety of the known. I suppose I just wanted to be sure that I hadn't been too quick to encourage. That I haven't unwittingly cast myself in the role of an enabler.